When Google unveiled Hangouts during Google I/O as its first step towards a unified, cross-platform and cross-product messaging client, the tech world took its best guess as to when Hangouts would also power SMS and MMS messages, leaving Google Voice in the dust. We were given confirmation that this would all happen at some point, but here we are some five months later without Google fully going that route. As the arrival of Android 4.4 “Kit Kat” nears, we have seen additional rumors point to this all finally happening, we just still don’t know exactly when or how. Will Hangouts remove Messaging altogether? Will full SMS and MMS integration into Hangouts be a Kit Kat-only feature? 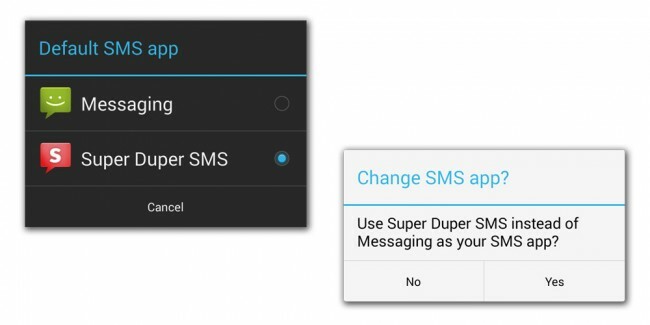 If the latest post on the official Android Developers Blog gives us anything, it’s a confirmation that there are big changes coming to the handling of SMS, MMS, and default SMS apps in Android 4.4. According to this post, Google is asking SMS app developers to make needed changes to their apps so that they can still function properly in Kit Kat. In Android 4.4, only one app can be setup as the “default” and receive the new SMS_DELIVER_ACTION intent and write (send) to SMS Provider. In other words, only one app can be the default for sending and receiving SMS and MMS messages. Developers have been asked to setup their apps with the option of being used as the default SMS app. The dirty details on making this change are all laid out at the source link below. It just looks to me that right now, Google wants there to be more power and integration with SMS apps, whether that be Hangouts or something from a 3rd party developer. Rather than 3rd party apps funneling text messages through the stock text app, this sounds as if it will give them the power to send them out by themselves. Goodbye, need for a stock Messaging app? Since I am by no means a developer, I’ll have to leave the rest of the speculation on this move to the devs in the building.